Any company whose operations include forklift, material handling, and/or aerial lifts needs to be thorough in their safety measures to avoid accidents in the workplace. Even the safest and most careful of operators may not be able to avoid an accident if the people around them are not aware of their movement. 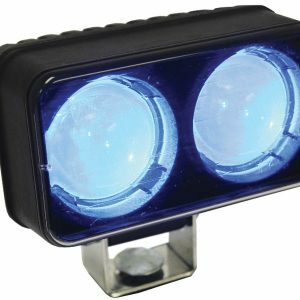 This is why you need the Safe Lite LED Red Pedestrian Alert Light. The beam of light that is emitted is almost impossible to miss. This is a great addition for those pedestrians that may be unaware that a forklift is working in the area. This is especially true for electric forklifts. 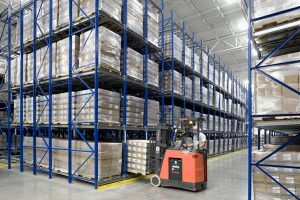 The lack of an “engine noise” can practically render them indistinguishable from other noises in a warehouse or production environment. 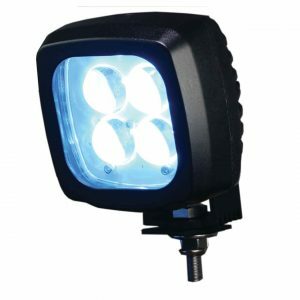 Adding a light can greatly help notify other workers of a forklift position in the work place. 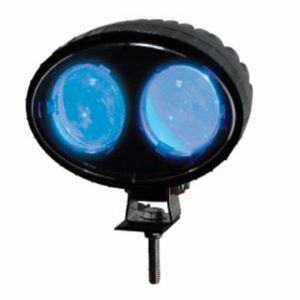 It is particularly useful on blind corners, loading docks or when exiting and entering aisles and trailers. 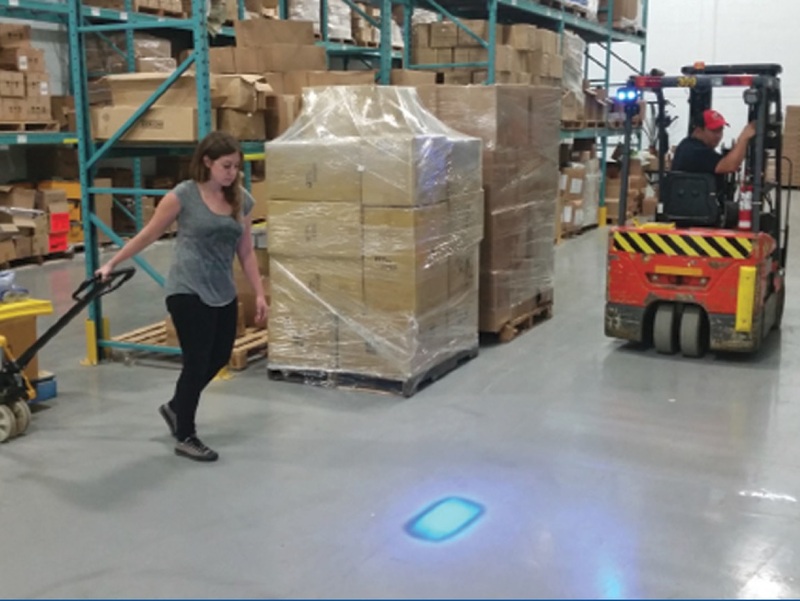 Each lights contains 2 LED’s which cast a bright beam ahead of the forklift, making it visible enough for other workers to ascertain not only the direction but also the speed at which the forklift is approaching. 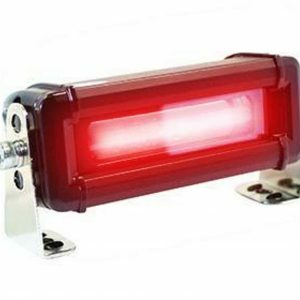 The safe lite LED red pedestrian alert light gives advance warning to pedestrians and others working in the warehouse that a forklift is entering their work space. 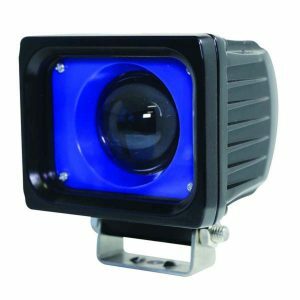 It does this by projecting an intense red light on the floor 10-20 feet ahead of the forklift (we also offer a Blue Safe Lite) . 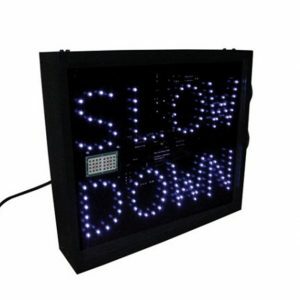 This helps prevent collisions and potential hazardous occurrences between the forklift and workers around the same area where there may be loud noise or diminished visibility. For optimum performance the lights should be mounted in a secure and high position ensuring that the beam of light is unobstructed. 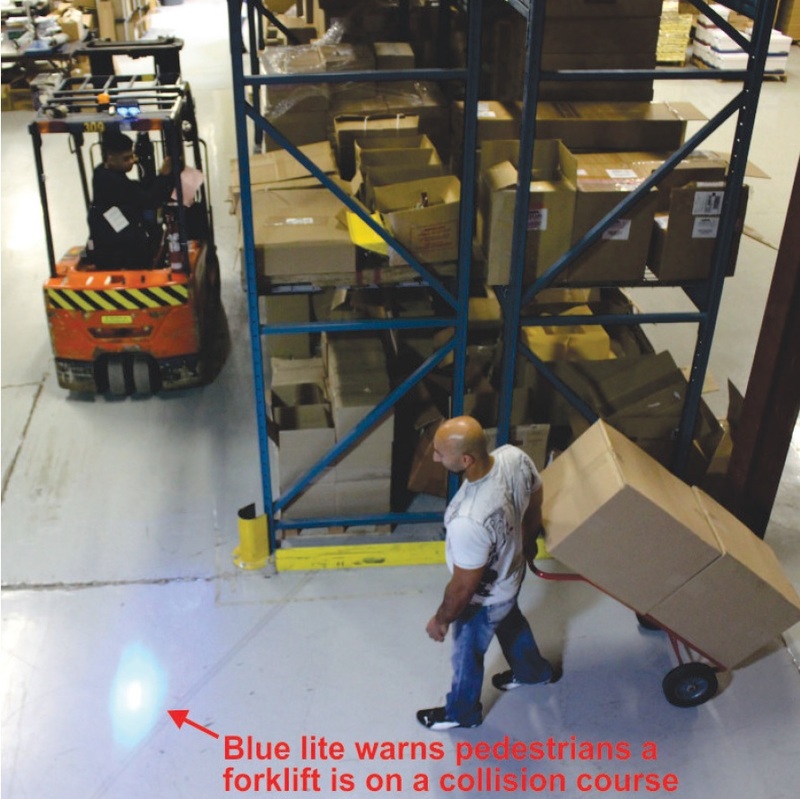 In order to be effective the beam of light must reach the ground ahead of the lift truck. This will ensure the pedestrians are able to see the red spot on the floor and react in ample time, reducing any instances of accidents. 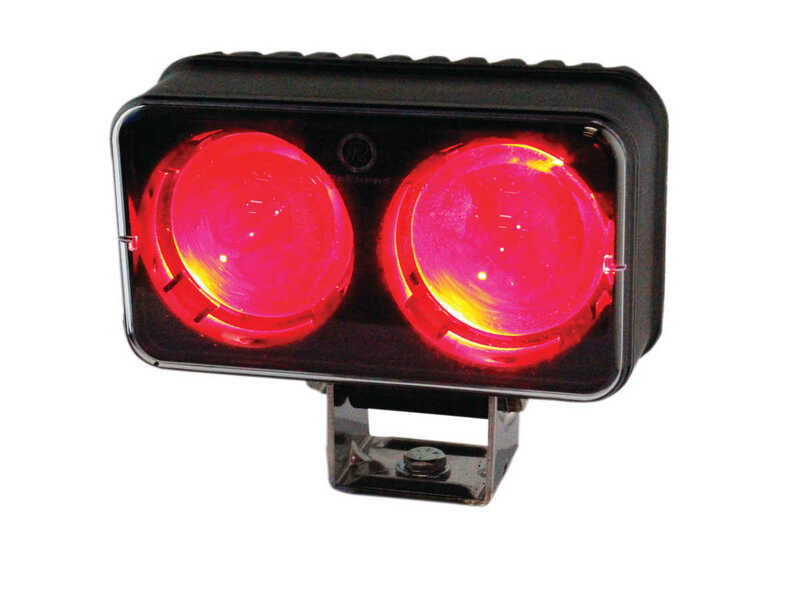 The Safe Lite LED Red Pedestrian Alert Light can also be mounted on other machinery such as sweepers, scissor lift, boom lifts and other work vehicles. You may also attach them to smaller, less noticeable machinery i.e. utility vehicles including: personnel carriers, burden carriers, and tow tractors, to signal their movement to others in the area. 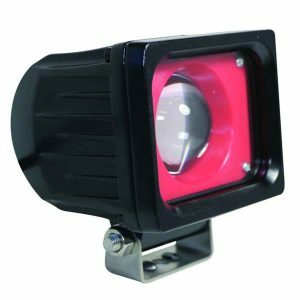 Safe Lite LED Red Pedestrian Alert Light Features: The Safe Lite Red has an operating voltage of 9-64V with an impressive 50,000 hours lifespan. There will be no replacement needed in the course of duty. It is fully protected from dust and water with an IP67 rating. 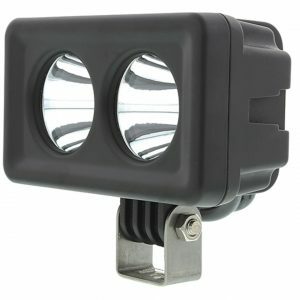 It’s high-performance 2 LED’s have an operating temperature of between 30-85C. 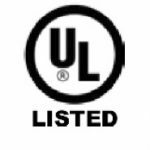 It is also U/L certified, assuring you of it’s superior quality. 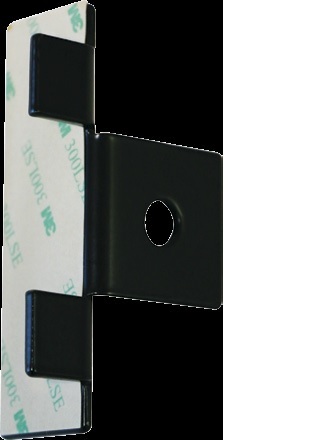 It comes with a steel mounting bracket and straps for easy installation saving you from incurring extra costs of buying them and having them installed. 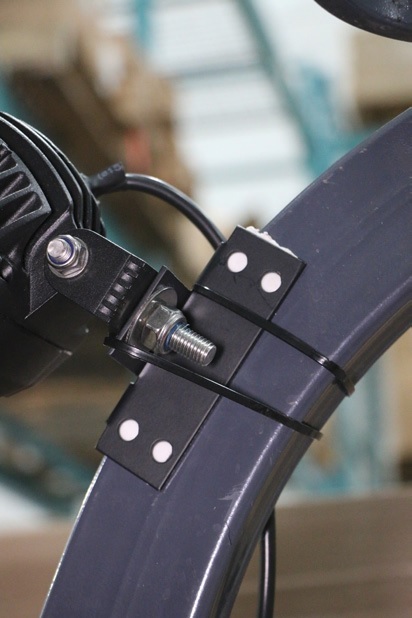 You may choose to install it on the front or the back of the forklift or any other industrial material handling equipment.